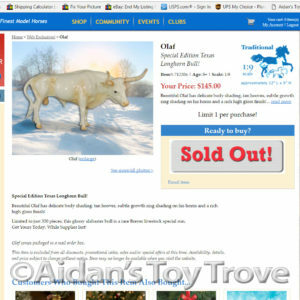 Home » Model Horse	» Breyer Olaf – Officially Sold Out Yowza! Breyer Olaf – Officially Sold Out Yowza! Breyer posted a surprise Web Special Run this morning. His name was Olaf and he was the Texas Longhorn mold in a glossy shaded alabaster. This fellow is now officially sold out. I believe that he sold out in less than 3 hours. Yowza! Breyer’s bulls have always been popular both with Breyer horse collectors and non collectors. I anticipated a sell out on Olaf but I didn’t think he would sell out as quickly as he did. 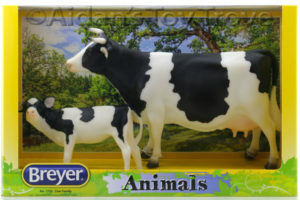 Breyer is discontinuing their 1732 Cow Family set at the end of the year. Between this and the popularity of Olaf, I hope that we can expect to see some more Breyer cows and bulls in 2017! Breyer Olaf – SURPRISE Web Special Run Texas Longhorn Bull! « Breyer Stablemate Club Django Is Ready To Order!